Special order Chocolate Truffle Pies! Oatmeal Cream Pies & Cake! Special order 6" layer cakes! Chocolate w/Chocolate Cream & Ganache and Vanilla w/Raspberry Filling & Vanilla Cream. Special order 9" layer cake. Carrot w/Walnuts/Raisins & Vanilla Cream. Here is a quote from one of the taste testers. "This pie makes me forget everything that was sh***y about today"
Gluten Free Brownies w/Wintermint Cream and Almond Chocolate Chip Cookies at the Co-op! Chocolate Truffle Pie test. Chocolate cookie crust, rich chocolate filling, ganache and candy cane topping. Gluten Free treats at the Co-op. Chocolate Cakes w/Vanilla Cream & Ganache, Cherry Coconut Cookies, Double Chocolate Brownies w/Walnuts. Vegan Pepperoni Rolls at the Co-op. Special order Gluten Free Cupcakes. Chocolate w/Vanilla Cream & Ganache! Sweet & Spicy Ginger Cookies, Mini Pumpkin Cheesecakes, Pumpkin Muffins, Cinnamon Cream Filled Pumpkin Cakes, Oatmeal Cream Pies, Everything Bagels and more at the Co-op. Pumpkin Pie Muffins, Oatmeal Cream Pies, Everything Bagels and more at the Co-op. Pumpkin Spice Cakes w/Cinnamon Cream, Pumpkin Muffins, Toasted Almond Muffins w/Cinnamon & Nutmeg, Chocolate Chip Cookies, Peanut Butter Cookies, Oatmeal Cream Pies, Ginger Cookies, Pepperoni Rolls, Everything Bagels and more at the Co-op. Mini Pumpkin Cheesecakes w/Ginger Cookie Crust, Crumble & Ganache at the Co-op. Full size Bundt Cake. Vanilla W/ Vanilla Cream. Special Order Cupcakes. 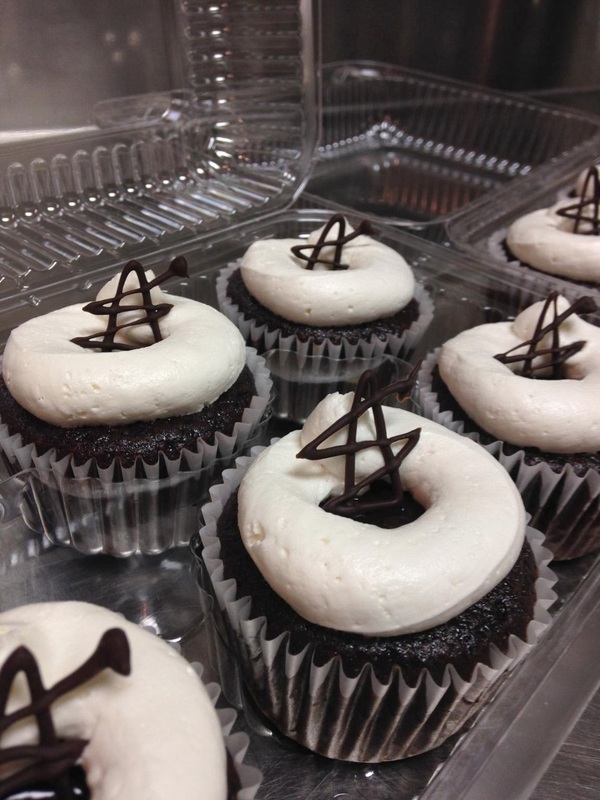 Vanilla w/Raspberry Cream, Vanilla w/Chocolate Cream, Chocolate w/Raspberry Cream and Chocolate w/Chocolate Cream! Lemon Cakes w/Raspberry Cream, Walnut Streusel Muffins, Pumpkin Pastries, Oatmeal Cream Pies, Peanut Butter Cookies, Everything Bagels, Pepperoni Rolls and more at the Co-op! Chocolate Cakes w/Vanilla Cream & Ganache, Vanilla Cream Filled Cakes, Pumpkin Muffins, Peanut Chocolate Chip Granola Bars, Oatmeal Cream Pies, Peanut Butter Cookies, Chocolate Chip Cookies, Everything Bagels, Pepperoni Rolls and more at the Co-op. Vanilla Cakes w/Raspberry Filling & Vanilla Cream, Chocolate Cakes w/Peanut Butter Cream & Ganache, Chocolate Cakes w/Raspberry Cream, Cherry Coconut Muffins, Pumpkin Muffins, Macadamia Chocolate Chip Cookies, Pumpkin Cinnamon Cream Cookies and more at the Co-op! Special Order Cakes form the Weekend. Gluten Free 6" Vanilla Cake w/Vanilla Cream and Coconut Cupcakes w/Vanilla Cream & Toasted Coconut. Pumpkin Spice Cakes w/Cinnamon Cream, Walnut Streusel Muffins, Chocolate Chip Cookies, Peanut Butter Cookies, Chocolate Cream Cookies, Granola Bars and more at the Co-op! Special order Gluten Free 6" Chocolate layer Cake w/Raspberry Cream. Gluten free treats! Pistachio Cranberry Cookies and Double Chocolate Brownies w/Walnuts are at the Co-op. Chocolate Cream Cookies, Pumpkin Muffins, Toasted Almond Muffins, Pecan Pastries, Everything Bagels, Pepperoni Rolls, Vanilla Cream Filled Cakes, Chocolate Cakes w/Vanilla Cream and more at the Co-op. Chocolate Cream Cookies, Pumpkin Muffins, Toasted Almond Muffins, Pecan Pastries, Everything Bagels, Vanilla Cream Filled Cakes, Chocolate Cakes w/Vanilla Cream and more at the Co-op. Chocolate Chip Cookies w/ Ginger at the Co-op. They also have Maple Cupcakes w/Vanilla Cream & Candied Walnuts, Pumpkin Pie Muffins, Cranberry Ginger Muffins, Oatmeal Cream Pies, Peanut Butter Cookies, Everything Bagels, Pepperoni Rolls and more. Everything Bagels, Pumpkin Pie Muffins, Cranberry Ginger Muffins, Pepperoni Rolls, Macadamia Chocolate Chip Cookies, Chocolate Cherry Cookies Chocolate Cakes w/Vanilla Cream and more at the Co-op. Oatmeal Cream Pies, Pumpkin Pie Muffins, Chocolate Cakes w/Peanut Butter Cream, Chocolate Cakes w/ Vanilla Cream, Vanilla Cakes w/Raspberry Filling & Vanilla Cream, Macadamia Chocolate Chip Cookies, Pepperoni Rolls, Everything Bagels and more at the Co-op! Gluten free treats at the Co-op! Coconut Date Truffles, Double Chocolate Brownies w/Vanilla Cream and Cherry Coconut Cookies.